Company Overview - Hangzhou Leisure Outdoors Co., Ltd.
Hangzhou Leisure Outdoors Co., Ltd.
Leshade Outdoors Co., a new fresh small company but filled with enthusiasm and energetic inspirations on the designing and manufacturing high quality canvas tents. Back supported with highly professional technicians and long years skilled workers, we are proud to offer you the excellent shelter solutions, like bell tents, teepee tents, wall tents, military tents, safari tents, refugee tents, marquee tents, shade sails to protect you safe and free of worry when you stay outside. Each product can be tailored according to your special requirements and also your budget to make sure everything is exactly as you would wish.Our aim is to provide you high quality products along with a helpful and friendly service to make sure all events or applications could be arranged as stress free as possible. 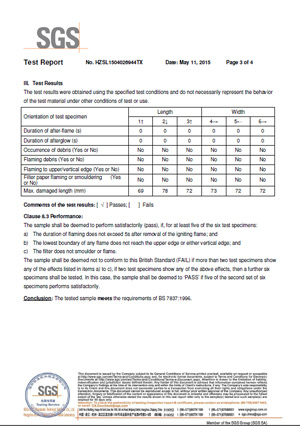 To determine the flammability performance of the sample in accordance with BS 7837:1996 Specification for Flammability performance for textiles used in the construction of marquees and similar textile structures.